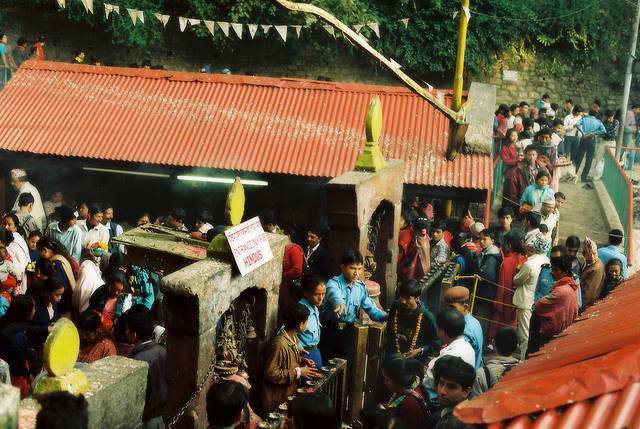 The blood‐soaked temple of Dakshinkali is located about 22 kms outside Kathmandu. It is dedicated to the goddess Kali, the most blood thirsty incarnation of Parvati. Pilgrims haul a bunch of chickens, ducks, pigs, goats and sheeps up the path to the temple to be beheaded by the temple priests in order to please the blood‐lust goddess. Saturday is known to be the big sacrificial day. During the annual celebrations of Dasain in october, the temple is swept with a crimson tide and the statue of Goddess Kali is bathed with it. Foreigners are not allowed in the temple courtyard, but can watch from the surrounding area.